Better by Design. Proven by Testing. Zero-Leak Gold® plugs utilize multi-seal technology, which provides a primary metal-to-metal seal with an independent secondary O-ring back-up seal. This combination of seals and the geometry of its design make Zero-Leak Gold the most reliable and cost-effective hydraulic fluid sealing option in existence today—that means no leaks. Guaranteed. Can be resealed repeatedly without loss of effectiveness. Requires no chemical sealants, which eliminates risk of contamination. Guaranteed not to leak or back out, even in vibration, temperature change and pressure spike situations. Zero-Leak Gold plugs have two seals. The first seal is a metal-to-metal seal created by the engagement of a taper in the SAE J1926 or ISO 6149 port with a mating taper in the ZLG fitting design. This engagement is several thousands of an inch long for minimal gap and high unit loading. This engagement also causes the removal torque to be greater than the insertion torque, as documented in the Fluid Power Institute tests conducted at the Milwaukee School of Engineering. The second seal is an elastomeric O-ring seal located under the taper in the ZLG fitting, which acts as a back-up seal should there be a failure with the primary seal. 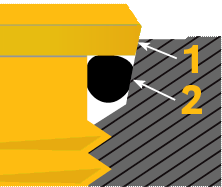 The Zero-Leak Gold O-ring cannot be extruded onto the spot face of the port, which prevents ZLG plugs from “backing out” as SAE ORB plugs counterparts are prone to do. The O-ring also cannot be forced into the interface of the plug or port threads, where it could be nibbled or damaged. ZLG plugs have been proven reliable through extensive testing by the Fluid Power Institute at the esteemed Milwaukee School of Engineering. They have been tested to 1,000,000+ pulse cycles without a leak, and 2,000,000 pulse cycles for Aluminum Zero-Leak Gold Plugs (ZLGPs). ZLG plugs are available for all SAE J1926 and ISO 6149 metric port configurations and are fully interchangeable with their straight thread, O-ring only, ORB counterparts. Custom sizes and designs, as well as magnetic styles, are also available. Zero-Leak seals, effectively using low assembly torques, lower the possibility of stripped threads and allow for repeated resealing without loss of effectiveness and without damaging the threads of the plugs or the ports. There’s no need for a chemical sealant, so there’s never a risk of contamination.